When compared with watchful waiting, CLND did not improve survival outcomes among patients with malignant melanoma who have positive SLNB. 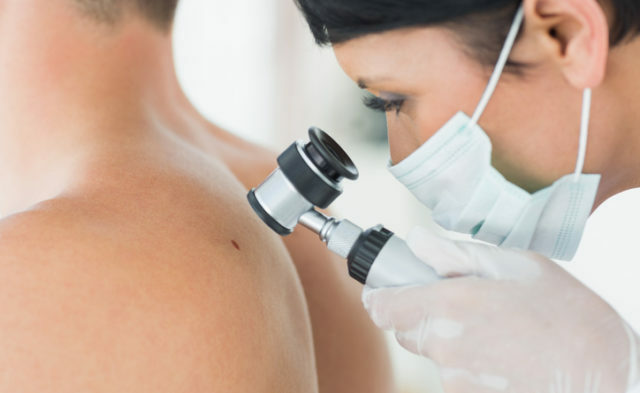 SLNB is a standard procedure among patients with melanoma who are at risk of metastases, with multiple studies confirming the prognostic utility of discovering micro-metastases in the sentinel node. The diagnostic usefulness of CLND post-SLNB however, requires further investigation. In the phase 3 DeCOG –SLT study (ClinicalTrials.gov Identifier: NCT02434107), 473 patients with melanoma were randomly assigned to undergo CLND or clinical monitoring only between January 2006 and December 2014; 240 patients were assigned to the CLND group and 233 to the monitoring group. Eligible patients had a tumor thickness of at least 1 mm and a positive SLNB with micrometastases with a maximum of 2 mm in diameter. The primary outcome was distant metastasis-free survival (DMFS), and secondary outcomes included recurrence-free (RFS) and overall survival (OS). After a median follow-up of 72 months, the 5-year DMFS rate was 67.6% (90% CI, 62.1-73.1) among patients who only received monitoring versus 64.9% (90% CI, 59.3-70.5) among patients in the CLND arm (hazard ratio [HR], 1.08; 90% CI, 0.83-1.39; P = .65). The 2 study arms also did not have any significant differences in 5-year OS with 71.4% (90% CI, 66.1-76.7) in the observation arm compared with 72.3% (90% CI, 67.0-77.6) in the CLND arm (HR, 1.01; 90% CI, 0.8-1.28; P = .94), or RFS with 60.9% (90% CI, 55.3-66.5) in the observation arm compared with 59.9% (90% CI, 54.3-65.6) in the CLND arm (HR, 1.01; 90% CI, 0.80-1.28; P = .94). A subgroup analysis based on tumor load in the SLNB revealed that the DMFS rate differed between cohorts that had a tumor load ≤ 1.0 mm and > 1 mm, but not between the observation or CLND treatment arms in the respective cohorts. The 5-year DMFS was 72.5% (90% CI, 66.4-78.6) and 68.7% (90% CI, 62.1-75.3) in the ≤ 1.0 mm cohort observation and CLND arms respectively (HR, 1.12; 90% CI, 0.80-1.57; P = .58), and was 51.7% (90% CI, 40.3-63.1) and 54.7% (90% CI, 43.1-66.3) in the > 1 mm cohort respectively (HR, 0.98; 90% CI, 0.63-1.53; P = .95). The 5-year lymph-node recurrence-free survival (LNFS) was 65% (90% CI, 59.4-70.6) in the observation arm and 65.9% (90% CI, 60.3-71.5) in the CLND arm (HR, 0.73; 90% CI, 0.73-1.23; P = .72). Regional lymph node metastases were reported in 10.8% and 16.3% of patients in the CLND and observation arm, respectively (P = .11). A multivariable analysis showed that tumor thickness and tumor load in the SLNB were independent prognostic factors for DMFS, OS, and RFS. Leiter UM, Stadler R, Mauch C, et al. Final analysis of DECOG-SLT trial: Survival outcomes of complete lymph node dissection in melanoma patients with positive sentinel node. Oral presentation at: 2018 ASCO Annual Meeting; June 1-5, 2018; Chicago, IL.